I’m pouring over my ponderous analyses into what the Bucks can and won’t and might possibly do over the next 4-6 weeks to fill the void created by Brandon Jennings‘ fractured left foot — in hopes of finding some sliver of foresight into the great and mystical Lakers-destroying powers of the Bucks’ 5-foot-5, 135-pound, 3rd-string point guard, EARL BOYKINS. Boykins scored 22 pts in 26 mins, hitting 4 of 5 three-pointers (8-for-12 shooting overall) as the Bucks shocked the Lakers in Los Angeles 98-79, holding the defending champs to 13 points in the 4th quarter while Earl bombed away from 3-point-land. Boykins was the difference, a game changing advantage off the Bucks bench that not Kobe, Gasol nor Artest and could overcome, much less Steve Blake, the Lakers backup point guard, who happens to be the only player ever traded for Boykins in Earl’s 12-season, 10-team NBA career. Nope. I’ve hardly mentioned Boykins this week in the wake of the Bucks’ announcement that Jennings would miss a month or more. I wrote that Boykins was “too, too short to guard anybody in the NBA,” grumbled about the point guards Bucks GM John Hammond let slip away and then spilled about 500 words mulling over the Bucks point-forward possibilities. “For the most part, it’s incumbent on Keyon Dooling to step up” in the absence of Jennings, I wrote. Brilliant stuff, wasn’t it? In my defense, I did describe Boykins as “electrifying” — but failed to even mention in that context that the Bucks had once traded Blake to Denver for Boykins (and Julius Hodge) for Earl’s electrifying entertainment value. The Bucks were tanking in 2007; Blake was set to become a free agent at the end of the season and had very little interest in playing for Milwaukee. Michael Redd wasn’t going to play, coach Terry Stotts was about to be fired and then-GM Larry Harris figured he might as well give Bucks fans a mighty mite scoring machine to watch the rest of the season. Blake was shipped to Denver; Boykins to Milwaukee. Harris didn’t offer Boykins a new contract in the summer. 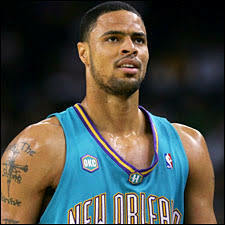 Blake signed with the Trailblazers, the team the Bucks had acquired him from (in a 2006 off-season trade for Jamal Magliore). When the Bucks picked the 34-year-old Boykins up off the NBA scrap heap this summer, Andrew Bogut and Ersan Ilyasova were all that was left of the 2007 Bucks, effectively making the Scott Skiles Bucks the 10th NBA team Boykins has played for in 12 seasons. It was all too fitting last night that Blake — again, the only player ever traded for Boykins — was the Laker most often found chasing Boykins around the Staples Center. Blake — who didn’t score in the game — didn’t fare so well, obviously, and by the time the Lakers subbed Derrick Fisher back in for the stretch, Boykins was was on fire, shooting guard John Salmons was in a groove and the Bucks were out-strong-arming the Lakers amid a game-clinching 22-7 run. YAHOO’S BUCKS-LAKERS PHOTO GALLERY (from AP). You’ll want to hit that link before yahoo moves it or zaps me for licensing no-nos. — AP photographer Jeff Gross reveals with 44 photos the tale of a gritty, determined Bucks team refusing to back down from the Lakers, finally breaking the will of the champs in an 4th quarter. Gross’ camera zooms in on Andrew Bogut‘s scowling matchup with Lakers’ center Pau Gasol and gives a shot-by-shot narrative of Kobe Bryan’t ejection from the game. Content Warning: Graphic grimacing, ugly defense, sweat. Here’s a sample — feel free to insert your own captions below. Please. Bogut and Gasol waged a titanic battle, the first half going to Bogut (11 points) as the Bucks successfully established AB’s post game. Gasol struggled all night to score against the NBA’s 3rd-rated defender as Bogut effectively shut down Gasol as a Lakers first option. But Bogut repeatedly left Gasol to help on Laker drives and Pau cleaned 7 off the offensive glass to finish with 15 pts and 11 rebs. Bogut matched his 15 and grabbed 8 rebs, also blocking two shots and taking a late charge on Kobe Bryant that led to Kobe’s ejection. Dancing big men: In a play that was typical of Gasol’s struggles against AB (the photo at left) Gasol dribbled into Bogut, found his path impeded, stopped, carried the ball as he kept his dribble and tried to force is way around Bogut. No call was made and the Lakers ended the possession turning it over anyway — but it got coach Skiles off the bench barking at the officials for not whistling Gasol for the carry. Not surprisingly, the Bucks 98-79 blowout of the Lakers’this week has been largely attributed to the Lakers lack of energy and focus, especially with ESPN pointing all eyes to the Lakers’ marquee Christmas Day showdown with the Heat. That’s too bad, because the Lakers reported “lack of interest” wasn’t all that evident watching the game live. They may have “gone through the motions” but isn’t that what the Lakers do until the 4th quarter? It usually results in a win (after the requisite Kobe highlights) and it’s what they’ve done all season against the softest schedule in the NBA. The Lakers opponent Tuesday night, the 10-and-16 Bucks, had played the league’s toughest schedule and battled the elite of the West even tougher. A week before the Lakers game, the Bucks beat the Mavs in Dallas and came within a traveling-on-Manu no-call at the buzzer of forcing overtime in San Antonio. There was much going into the Bucks-Lakers matchup that had nothing to do with the Lakers state of mind. Here’s some of it. 1) The Bucks’ pride had been wounded the night before in Portland (a 106-80 loss). Even without injured point guard Brandon Jennings, there’s talent in the Bucks core. Center Andrew Bogut is an All-Pro, shooting guard John Salmons a proven 20-point per game scorer, Ersan Ilyasova and Luc Richard Mbah a Moute two young, hustling, hard-nosed forwards who’ve won more than they’ve lost for coach Scott Skiles. These days, the Bucks core is desperate to prove that last season’s 46 wins were no fluke. They played with urgency, hunger — and it’s not as though Kobe Bryant, Pau Gasol and Lamar Odom, and Matt Barnes off the bench, didn’t. Media heard nothing from an angry Bryant postgame, and Gasol and Odom weren’t exactly running to the microphones and tape recorders either. 2) The Bucks D, currently rated 6th in the NBA, was solid all night, as stingy as it’s ever been in the 4th quarter as Skiles relied on his core — Bogut, Ilyasova, Mbah a Moute and Salmons — and Boykins. Bogut had Lakers center Gasol harnessed most of the game, Ilyasova wore down ailing Lamar Odom, who was less and less a factor in the 2nd half, and Mbah a Moute and Salmons’ defense on Kobe was about as good as it gets. Mbah a Moute, who lives in L.A. and is an off-season friend of Bryant, put on a defensive clinic against his mentor on five or six consecutive possessions in the 4th — and the refs set new Bucks-Lakers precedent by letting them play. Unfortunately, the clinic didn’t make the highlight reel. Derrick Fisher and Ron Artest were offensive non-factors — negatives, in fact; and nobody on the Lakers bench cut loose for a big scoring night, as Shannon Brown did Nov. 16 in Milwaukee. 3) The foul story. The refs whistled more fouls on the Lakers (19) than on the Bucks (18). That’s unheard of — indeed new precedent for the Skiles Bucks and Phil Jackson-Kobe-Gasol Lakers. Not coincidentally, Skiles recorded his first win as Bucks coach against Jackson and the Lakers. 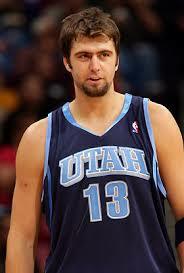 4) Bogut, Salmons and Ilyasova. Bogut was a better center than Gasol last night, no big surprise to anybody who’s been paying attention to the Bucks and Bogut since last season. His post-up offense in the first half (11 pts) set the tone — and the stage — for the Bucks upset, and while Gasol scored 15 the Lakers’ offense bogged down repeatedly when the ball went to Gasol posting up against Bogut. Ilyasova is a rising young power forward in the league who — despite a rough start and an early-season benching by Skiles — has successfully locked horns with the likes of Paul Millsap, Kevin Garnett and now Odom, who’s off to one of his best starts in years. Odom took it right at the Ilyasova eary in the game for six driving points but forgot to guard Ilyasova’s jumper or block Ersan off the boards. By halftime, Ilyasova had 13 pts. 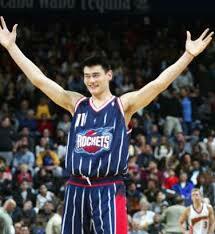 By the 4th quarter, Ersan was beating Odom to the glass. By the final minutes, Odom was resorting to cheap shot fouls on the last of Ilyasova’s 11 rebounds. Odom finished with 12 pts, 10 rebs. Ersan had 17 and 11. It can’t be said that Salmons outplayed Kobe, and he had defensive help from Mbah a Moute — but Salmons won the offensive efficiency battle. Salmons had 20 pts, 6 assists and 2 turnovers. Kobe had 21 pts on 9-16 shooting but turned it over 4 times and dished for only 2 assists, less than half his play-making average. At the end of the game, the box score read: 52 pts, 22 rebs, 11 assists and 9 turnovers for Bogut, Ilyasova and Salmons; to 48 pts, 24 rebs, 10 assists and 9 tos for Gasol, Odom and Kobe. It looks nearly dead even until you look at the shots taken board — 48 shots for the Lakers to 42 for the Bucks, adjusted for free throw attempts, of course. That’s a ten-point advantage to Bogut, Ilyasova and Salmons even if the Bucks were shooting 35% — which they weren’t. With Boykins (4-for-5) and starting point guard Keyon Dooling (2-for-4) shooting a combined 6-of-9 from the Land of Ray and Reggie, the Lakers needed either a Christmas stocking full of big shots from the supporting cast or help from the refs to stay in this game. They got neither. 5) The supporting casts. The Lakers bench, playing against a shorthanded Bucks crew, kept them in the game until early in the 4th quarter, then faltered when the Bucks reserves found a higher energy and intensity gear. Blake didn’t score in the game. Shannon Brown disappeared in the 2nd half. Ron Artest and Derrick Fisher shot a combined 3-for-13 and basically killed the Lakers chances. Boykins looked ten years younger dribbling circles around 36-year-old Fisher, and Fisher’s strong arm tactics, which might have deterred a younger Earl Boykins, couldn’t slow the 34-year-old Boykins. 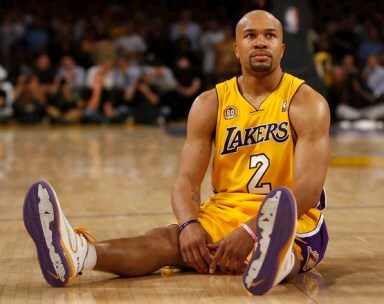 Fisher’s usefulness to this Lakers team has got to be nearing its expiration date. Salmons and Mbah a Moute weren’t about to be physically intimidated by Artest, though Chris Douglas-Roberts was relegated to a quiet 20 mins. A quiet game for Ron-Ron — but not so out of the ordinary. He’s had a lot of those in his career. Both Fisher and Artest generally suffered from the lack of ball movement created by Kobe and Gasol. 6) John Salmons. Fish has found water. As stupid as that metaphor sounds, it’s a huge relief for the Bucks to have Salmons back to last season’s 20-pts-per-game form, when the Bucks finished the season 22-8. Salmons’ shooting woes have helped sink the Bucks to their 11-16 record, and they’re still dead last in NBA shooting percentage. Yet Salmons lit the Blazers up for 23 pts in the 2nd half Monday and scored an active 20 on 14 shots in LA Tuesday. The Bucks 40% shooting can’t possibly endure statistical probability, and neither could Salmons’ prolonged slump. 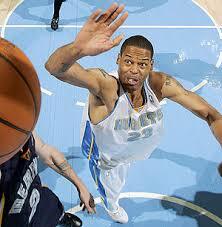 7) The absence of Corey Maggette and Drew Gooden. Maggette, who suffered a concussion last week against the Spurs, was in street clothes on the Bucks bench, hopefully taking notes on the good ball movement and offensive flow that the Bucks had going against the Lakers. 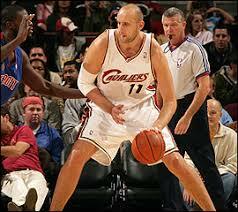 Gooden was in Milwaukee, still suffering from plantar fasciitis in his left foot. Chemistry has been an issue with the Bucks this season. As harsh as it sounds, one has to wonder whether the Bucks fourth quarter would have been possible with either of the new acquisitions on the court. Skiles has been loathe to play Mbah a Moute and Ilyasova together — yet doing so in LA helped lock the Bucks into an aggressive, attacking defense that not even Kobe Bryant could solve. 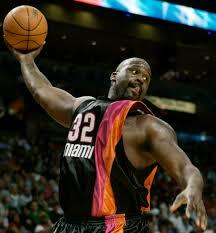 Chances are that fourth quarter defense would not have happened had Skiles had Gooden or Maggette at his disposal. And it’s doubtful the Bucks would have exploited Boykins’ hot hand as well as they did given how much Maggette and Gooden demand the ball, sometimes for reasons apparent only to them. Ersan and Luc played a combined 60:30 — possibly unprecedented — and the Bucks don’t win without them. 8.) The Ersanity Factor. The 11-16 Bucks are now 7-6 when Skiles plays Ersan Ilyasova half the game (24 mins) or more. Ilyasova played 33 mins in LA. 9) The Lakers. It’s useful to remember that the Lakers were seriously challenged by the Suns in the Western Conference Finals last season, and were more than a little lucky that Artest played the game of his life in Game 7 to beat the Celtics in the Finals (Kendrick Perkins’ injury in Game 6 also duly noted). Kobe’s Lakers are far from invincible, and never were as good as ESPN — and certainly not Lakers fans — have made them out to be. Over time — and perhaps as soon as the Christmas Day showdown with the Heat — this loss to the Bucks will look less and less like “a trap game” in which the Lakers “went through the motions,” and more and more like a game in which an up-and-coming young team was tougher — mentally and physically — than a fading champion. 10) The Lakers “deserved to lose.” That’s a post-game quote from Fisher, and I can’t argue with it. The underrated and shorthanded Bucks, for one night, were the better team. 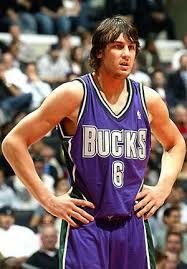 And 5′-5″ Earl Boykins was better, much better than Derrick Fisher and Steve Blake. This entry was posted in The Jinx and tagged Andrew Bogut, Andrew Bynum, Earl Boykins, Ersan Ilyasova, John Salmons, Kobe Bryant, Lamar Odom, Larry Harris, Los Angeles Lakers, Luc Mbah a Moute, Pau Gasol, Steve Blake on December 22, 2010 by J.D. Mo. It can’t be written better than Wojnarowski wrote it for Yahoo Sports. 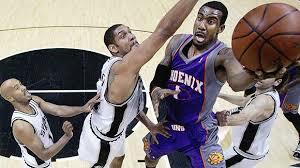 “It” being The Play that has so far defined the 2010 NBA Playoffs. It … “came out of nowhere, out of Rajon Rondo’s(notes) wildest imagination. The ball poked into the backcourt, and the Orlando Magic’s Jason Williams(notes) chased it past midcourt and all the way to the 3-point line. He had a good step, maybe two, on Rondo, and just when Williams reached down to pick up the ball, Rondo did something you’ve never seen on the basketball court – one more thing that makes you wonder what in the world can the Los Angeles Lakers do with him. Rondo dove flat-out, thrust his arm between Williams’ legs, used his right hand to stop the ball and scooped it into his control. When he transferred the ball from his right to left hand, Rondo was still laying on the floor. Williams had watched all of this happen in a blur, and just stood there, blankly, wondering what the hell was happening around him. 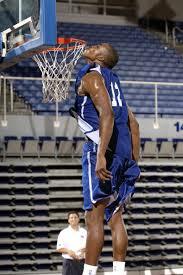 Rondo bounced to his feet, dribbled hard twice, crossed over the Magic guard and hit a twisting, spinning layup. When you watch the play again and again in slow motion, take a long look at the fans on the baseline. Eyes wide, jaws dropped, those were the precise expressions. These are the playoffs of Rajon Rondo leaving everyone with a “What the %$&! did he just do?” moment. The “quarterback” has defined what’s right with the Boston Celtics on their run to the finals — Rondo is everywhere, offensively and defensively, he wants it more than the point guards in front of him, and is making the right decisions running the Celtics offense. Ray Allen, Kevin Garnett and Paul Pierce are still good enough to make it very difficult to beat the Celtics in a seven-game playoff series, even moreso when their young point guard — next to an offensive liability in 2008 — is making magical plays. Rasheed Wallace, Tony Allen and Big Baby Davis give the C’s the bench edge. It’s a better bench than the 2008 champions, though not as slick on the perimeter (no Eddie House, Sam Cassell or James Posey). The Celtics are beating teams much closer to the hoop this time around. For the Lakers, Ron Artest and Andrew Bynum give the Lakers some toughness and tallness that they lacked two years ago. Artest, in particular, gives them a defensive option on Pierce and Allen that they didn’t have in 2008. However, try as I might, it’s pretty difficult to imagine Ray and Pierce being outmanned by Artest — unless the officials allow Ron-Ron’s defensive mayhem and antics on the perimeter. 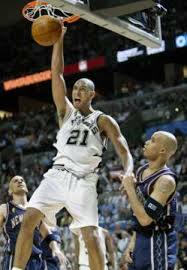 But I don’t see it bothering Pierce too much, while Allen takes a certain glee in getting Kobe’s goat, dating back to the rivalry that developed when Ray ended up in Seattle in 2003 — “I don’t want to hear my name mentioned in the same sentence as Ray Allen,” Kobe said two years ago. This is no friendly rivalry. So where does that leave the Lakers? Kobe’s the man, banged up or not (he’s probably in pretty good shape after a week off) but Pau Gasol’s scowl still doesn’t equal toughness against Perkins, Garnett and Rasheed. A lot depends on Bynum and forward Lamar Odom. This is not necessarily a bad thing for the Lakers, as Odom is usually an all-around menace against the Celtics, against whom his experience counts more than scowls and antics. For Bynum, the 2010 Finals are another big moment, proving ground to claim a piece of turf in the NBA paint, territory that he’ll be battling for for years to come with the Howard, Bogut (the other AB) and Noah. Gasol will need his help as the Celtics form a crowd near the basket as they did to Dwight Howard in the East Finals. Perkins is two seasons more crafty than he was in 2008, and his new partner in crime is the always volatile Rasheed, more than a match for Pau. I like Bynum’s chances of having a major impact in this series. Bynum is the only 7-footer in this series, standing out in a mean crowd of 6’10” and 6’11” big men. 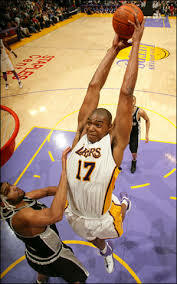 Wingspan matters, but is Bynum tough enough? We’ll find out how much the Lakers missed him in 2008. Prediction: Close to call overall, of course, and I’m loathe to make predictions. The Celtics are playing better basketball right now. That’s worth a few games early on. The longer the series goes, the less I like the Celtics chances. Best way around this dilemma is a duel prediction: Celtics in six. But if they can’t finish the Lakers off in LA by game six, Lakers in seven. This entry was posted in NBA Playoffs, The Jinx and tagged Boston Celtics, Pau Gasol, Rajon Rondo on June 3, 2010 by J.D. Mo.